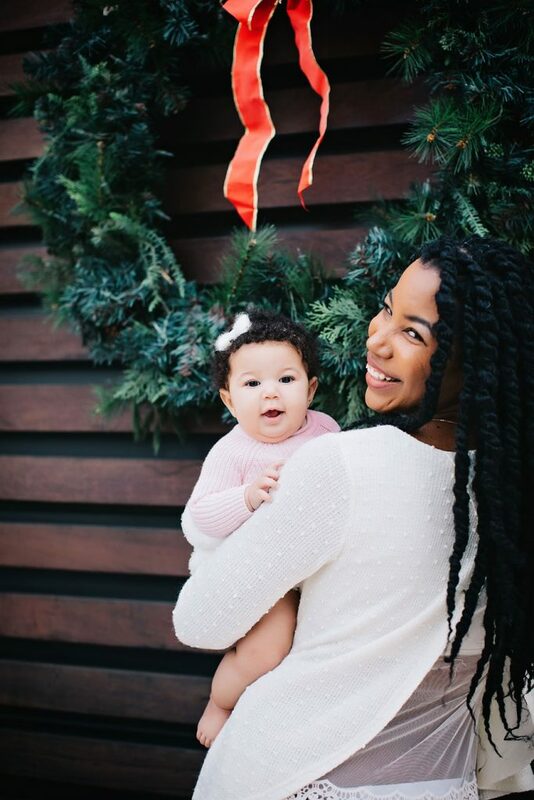 I’d like to say that a new baby and a move scheduled for this month is what put me behind on sending out Christmas cards. But let’s be real, it wasn’t going to happen anyway. I may still try to get a New Year’s card out but at the same time I’m not really trying to be awesome right now. On a serious note, I’m so thankful for this little family of mine. And I’m keeping this short so I can get back to more time with them. 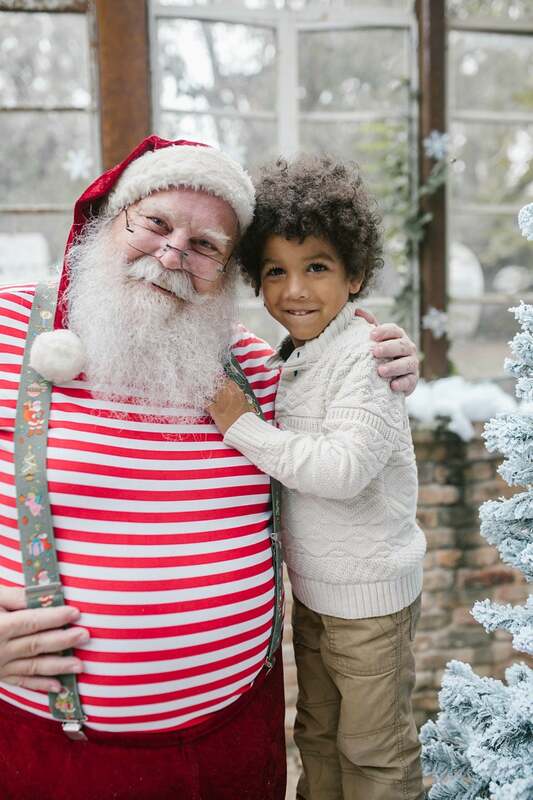 I don’t remember my first time seeing Santa Claus, but I distinctly remember being excited to sit on his lap each year and tell him what I was hoping for for Christmas. 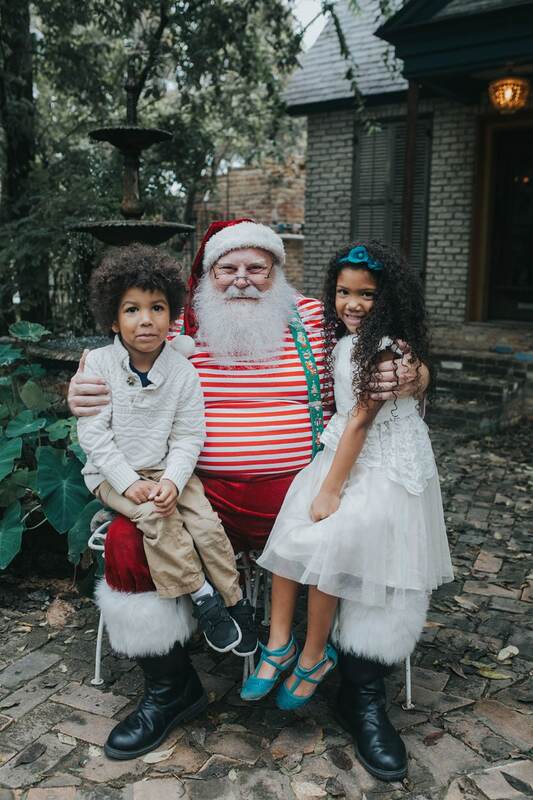 My parents weren’t as diligent about getting a classic picture with old St. Nick every year but it’s something I look forward to doing with my kids every year. It started with my daughter. 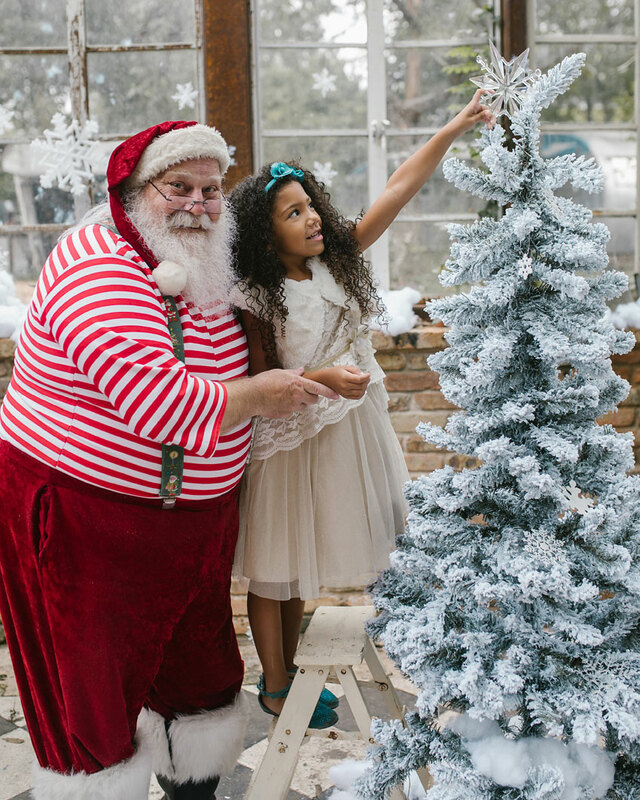 She wasn’t ever afraid of the big guy in red. 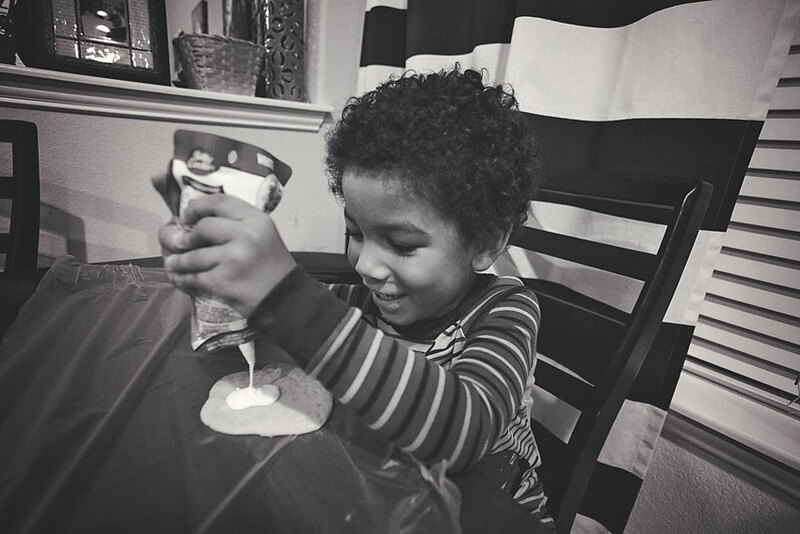 When my son came along he was hesitant for a year or two, but now he’s just as excited to see him as anyone. 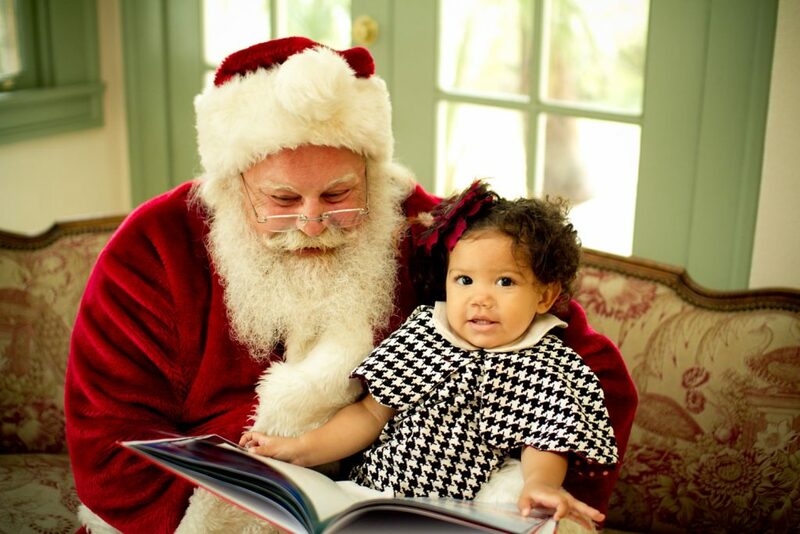 I’ve rounded up my favorite Santa photos from the last seven years to show off in this post. We made it the last seven years with just one Santa breakdown. And another close call the year after. 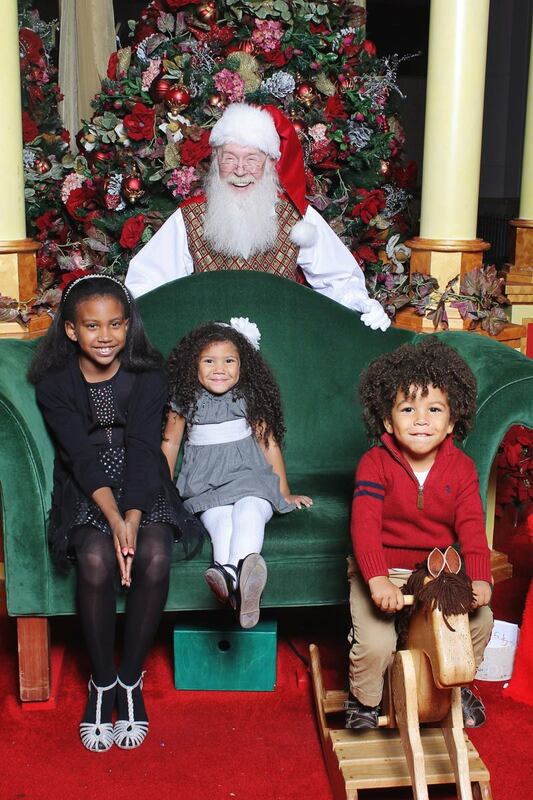 But thanks heavens for a rocking horse and sneaky Santa for saving the photo. I love how carefree and happy Christmas is for my children. All of the hustle and bustle is worth it as I see their (mostly) smiling faces. Looking back at these photos I can see so much of their personalities that were present as such a young age. My son, the emotionally hesitant one, and my daughter, the whimsical dreamer. And yes, we are going to keep doing these photos until they are begging me to stop. (And probably even for a few more years after that). I hope that my kids grow up to cherish these memories like I do. Even if it looks like I was torturing them a little. I’m wrapping up my first year working as a #TalkEarly ambassador where I’ve shared my thoughts and ways of talking about alcohol and alcohol responsibility with my kids. I never knew how important it was to talk to our kids about this at an early age, even if we don’t drink in our home. You can find a wealth of knowledge over on the #TalkEarly page and find more information on building a lifetime of conversations with kids around alcohol responsibility. The nonpfofit Responsibility.org sponsored today’s post, however all thoughts, opinions and stories are my own. The night before Christmas we queued up home videos of our last few Christmases. The kids were so amused. 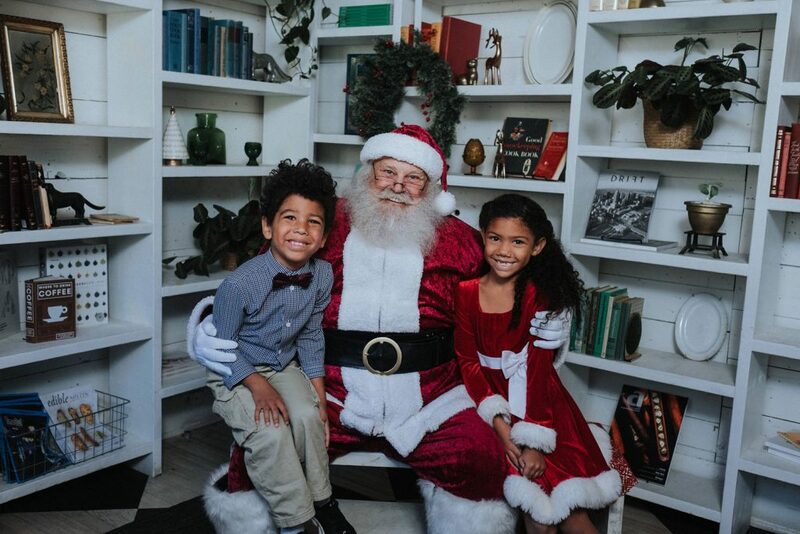 My son, who is kind of sort of getting the concept of Santa now, especially loved watching them. And it made the next morning even more magical for the both of them. The time from early December through New Year’s is my favorite time of year. I love taking in all of of my the twinkling lights, seeing their reactions to their new gifts, looking back at all we’ve achieved in the last year and setting goals for the new year ahead. This year, even more than just with photos I wanted to document these lasting memories in video. 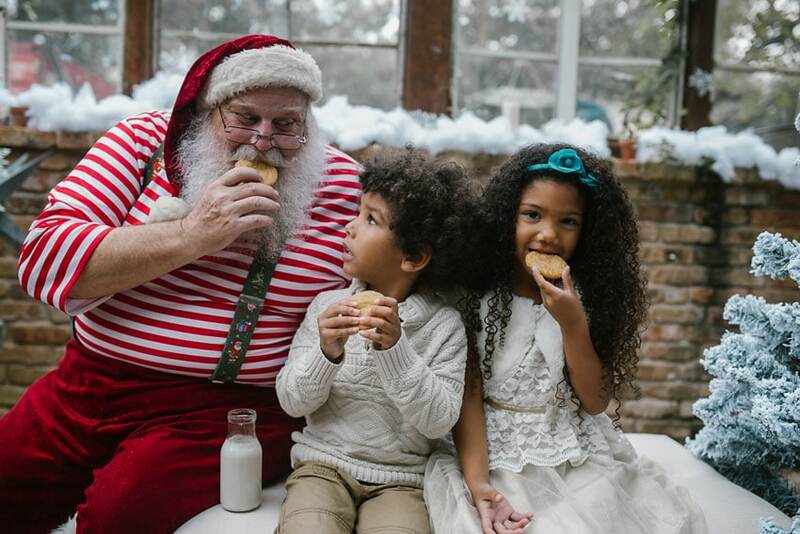 From meeting Santa to decorating his cookies, to opening presents–this holiday was all I’d hoped it would be. I made another video for us to look back at and to cherish in years to come. This all shot on my Canon EOS 5D Mark IV. I had so much fun making videos of special milestones with my kids this year and it’s something I hope to do more of next year. The kids grow so fast and this seems to be a perfect little time capsule of the here and now. 1. Keep a camera handy: The more often you bring your camera with you, the more likely you are to get used to it and take it out to use it. If your camera does both it’s just a switch of a button to change to video mode. Between snaps take a few seconds of video so you can remember more about that special milestone. 2. Keep the clips short: No need to record a feature film. Ten seconds or so here and there will do the trick and actually make editing a little easier later on if you aren’t hunting through an hour of footage for the clips you want. 3. Get a variety of angles and distances: Take the video in wide angles and close ups so when you edit it together later it helps the story flow in a sequence. 4. Use a camera with autofocus: This make a huge difference. The new Canon DSLRs like the EOS Rebel T6i, the EOS 80D and EOS 5D Mark IV have video autofocus and touch screens so you can tell the camera what part of the picture you want it to focus on, and adding some nice depth and artistic focuses with just the touch of a screen. 5. Edit ASAP: From personal experience, I find the sooner I get to editing my videos the more likely they’re to get done. Otherwise I have a bunch of clips just sitting there to scroll through. That’s fun too, but it’s even better when I sit down to string a story together so I can not only free up space, but have a treasure to look back on. Each one is like a video version of a designed photo book. As much of a whirlwind as it was, I’m sad to see 2016 go, but I’m glad we ended it like this. And I’m excited to ring in the new year with this crew of mine. From birthdays to family vacations, to holidays and more, I’ve teamed up with Canon every month to share how we capture our special milestones. 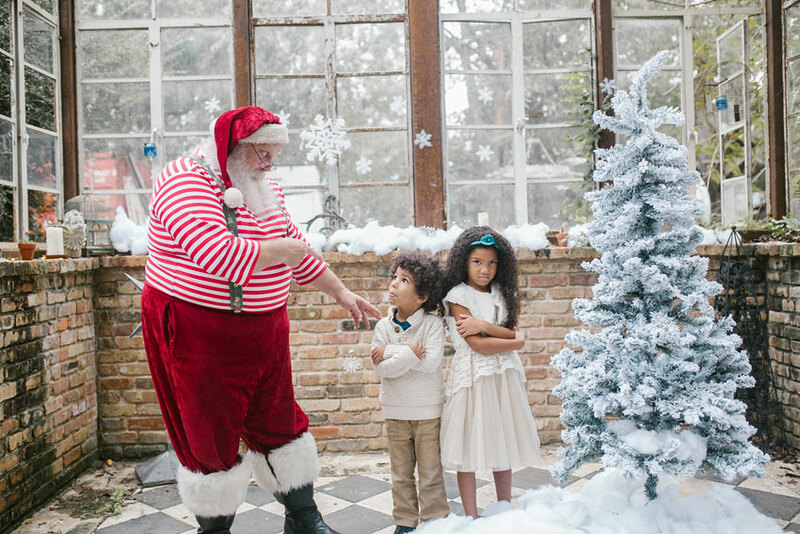 I’m also dishing out tips to help you better capture your special moments with your family. Shout out to my favorite camera brand for sponsoring this series. Some things never change I tell ya. I always go into the holiday with good intentions to finish my holiday shopping early, take a bunch of Christmas photos, send out my holiday cards and have everything wrapped and ready a week early. 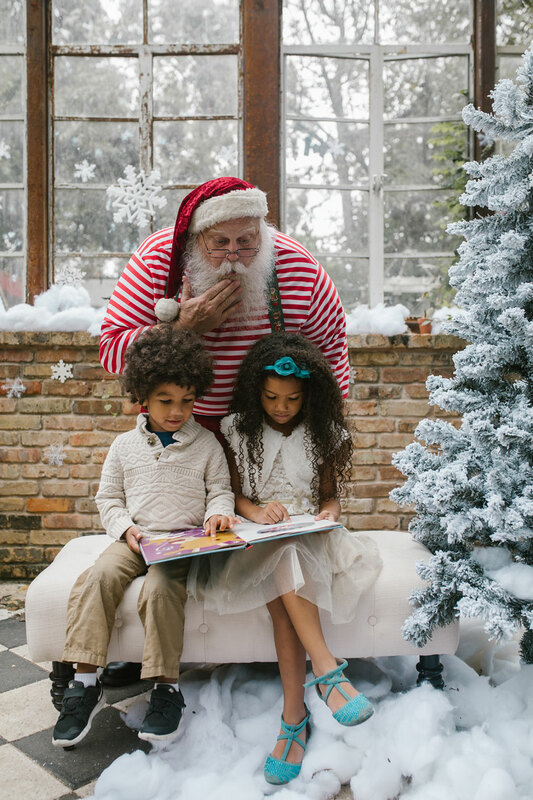 I start with my kids and make a list for all who we need to shop for. Then a few weeks pass and then before we know it we’re a week out and I’m still where I was a month ago. What can I say–I’m a chronic holiday procrastinator. The one thing that throws a kink into my holiday planning every year is our anniversary, just two days before Christmas. Considering we’ll be getting a way for a couple of days to celebrate, that cuts my Christmas prep time down to three days. Yikes! 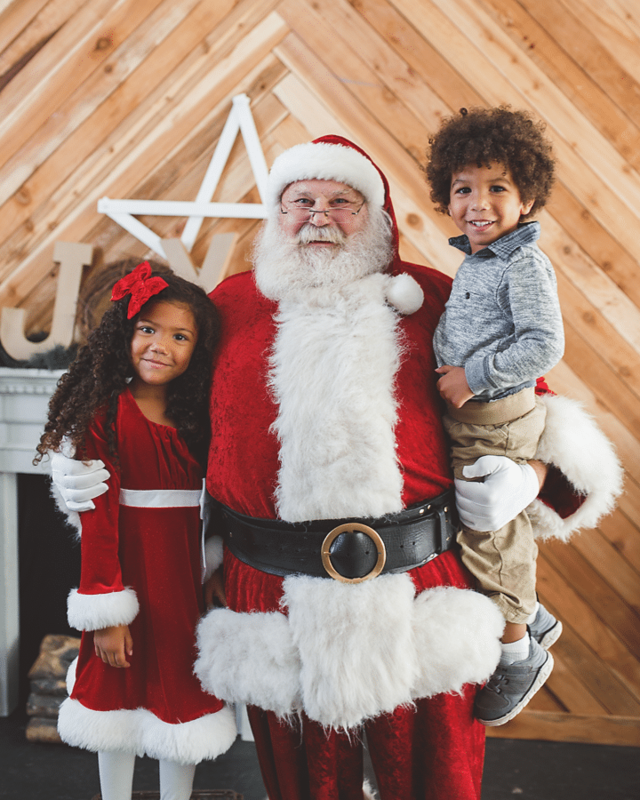 So far I have the kids items picked out: Something they want (from Santa), something they need, something to wear and something to read. None is wrapped yet. Actually most is stacked in boxes near my front door. But I’m hoping to let the kids visit with Granny for a little while os my husband and I can go through the gifts and start wrapping today. I still need to shop for my parents, sisters, my husband and my son’s preschool teachers. I also need to pick up a book for his gift exchange. I also have a work checklist, food to buy/prepare, some Christmas lights to see and songs to sing, and some things to plan to get ready for our anniversary… But other than that I’d say we’re pretty good. avoiding the holiday shopping crowds. Despite the long list of things I have left to do, this still is my favorite time of year. I kind of love the chaos. The clock is ticking but somehow it’ll all come together like it does each year. And Christmas day will (hopefully) be as magical for my kids as it was for me when I was their age. Are you a last-minute shopper like me, or are you already done? Leave a comment letting me know something you’d like to get last-minute from Sears.com/gifts and you’ll be entered to win a $100 gift card to Sears! 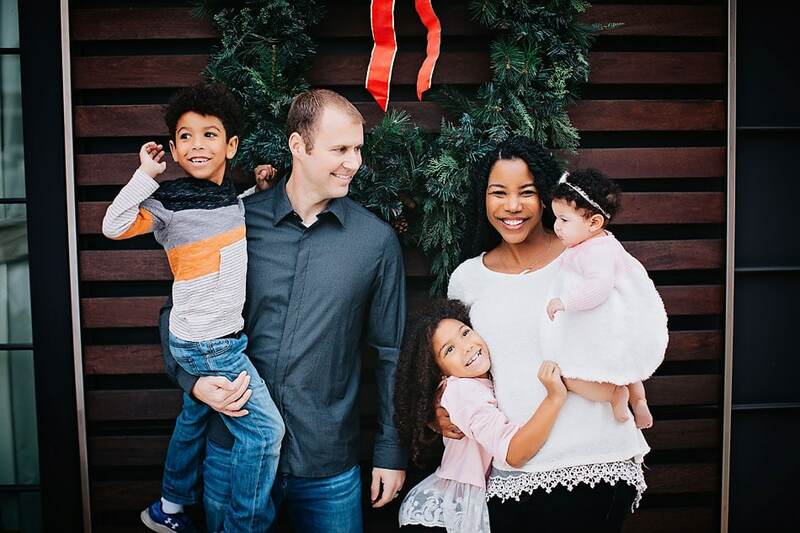 *I’m passionate about spending quality time with my family and I love it when stores make that easier for me by making shopping, faster, easier and more affordable. That’s why I’ve partnered with Sears for this post. Be sure to check out Sears.com/gifts while you’re working on your holiday shopping and give their free in-vehicle pickup service a try! 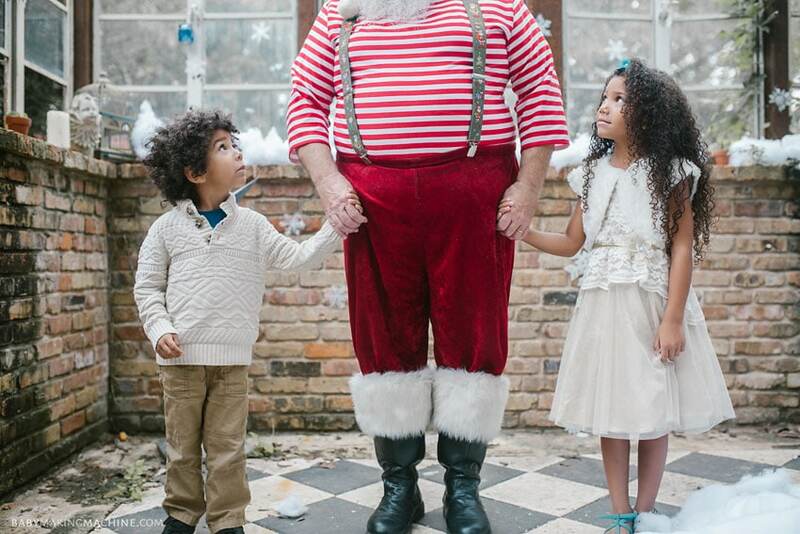 Are Your Family Christmas Traditions as Weird as Ours? I’m a sucker for magic and now I get to relive it all through my children’s eyes. I mentioned before how I was anti-elf but have was sortof tricked into doing it. Now I actually kind of enjoying it. I’m still not one of those creative-Elf-placers. I simply move it from one spot to the next–But the excitement on my kids’ faces every morning when they find her (yes, even my son seems to be into it now!) has me on board. I love the spirit of joy and giving all season long. I love hot chocolate and Christmas movies and music. And I love our quirky traditions. 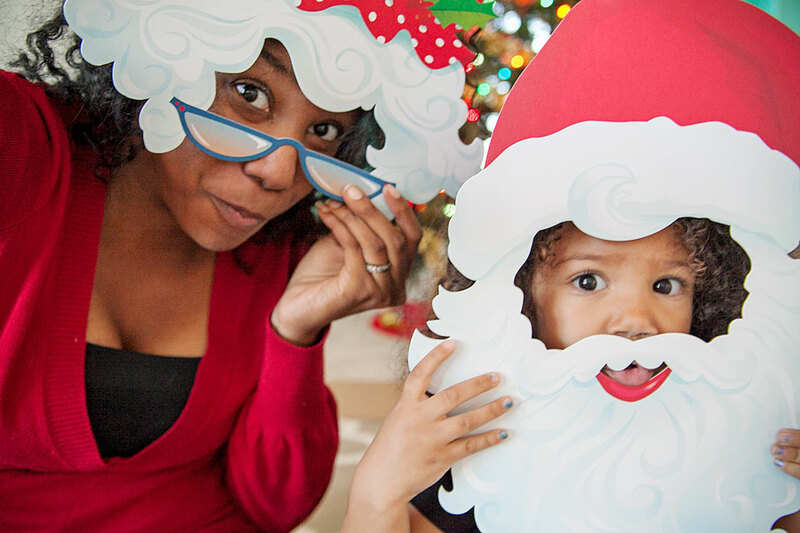 We have at least three weird family Christmas traditions. 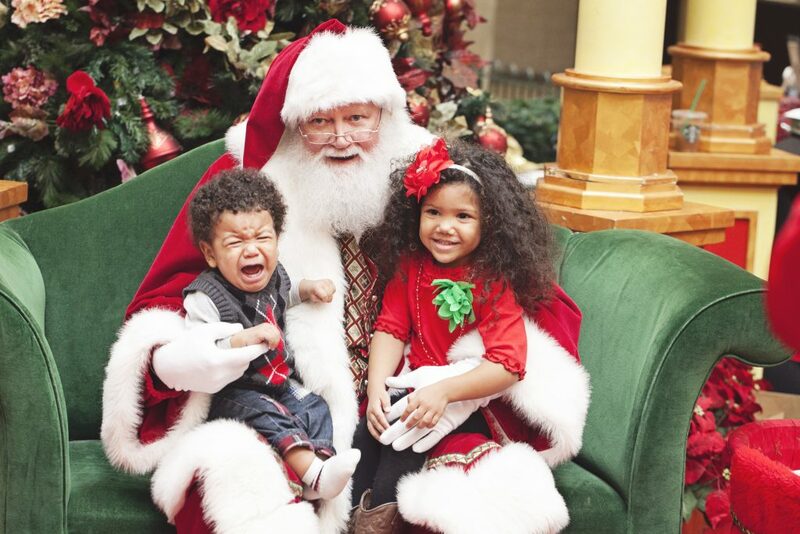 One is getting pictures with Santa. 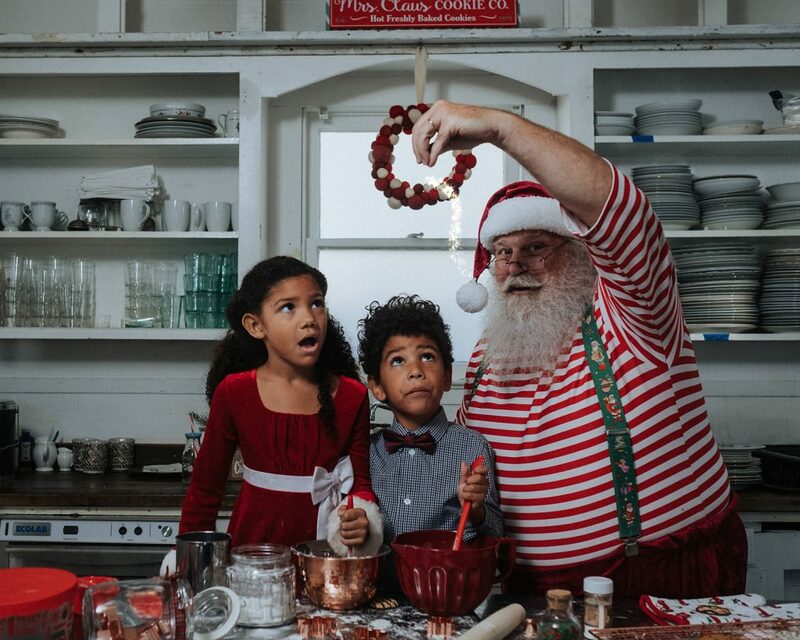 But not just the Mall Santa–Though we still do that too sometimes–But full-on photoshoots with the jolly old fellow. We’ve done pictures with Jackie Willome four times now. The kids have a blast and I always love how they turn out. Next year I ought to video the experience. So I have to explain this one. 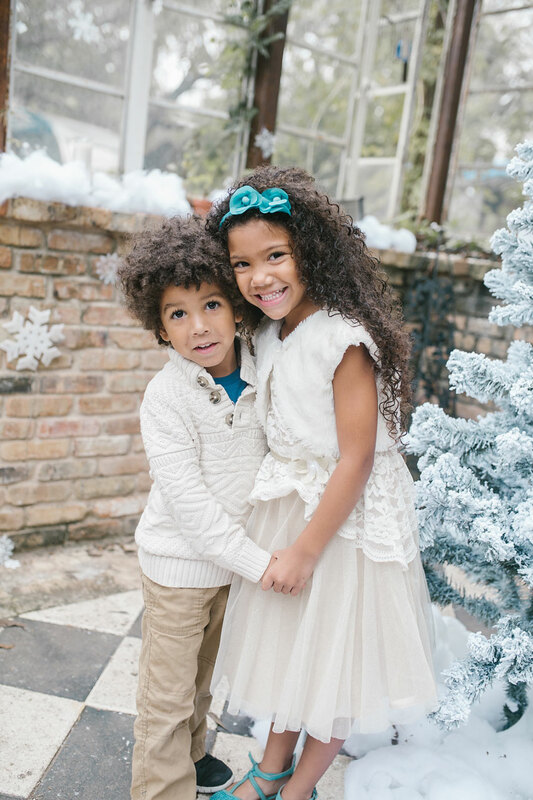 They were told to “pretend to be naughty” Lil’ J struck her pouty face and Big T tried his best to stick his tongue out. It’s a different side of my kids you usually don’t see here on my blog. I’ve actually never seen him stick his tongue out but he’s pretty good at jumping off of things and driving me up the wall. Lil’ J’s stank face is pretty accurate. The next few photos are more on the “nice” side. Another quirky tradition we have is our dollar store gift exchange. Every year about a week or so before Christmas we go to the Dollar Tree and sneak around the aisles, shopping for one another. This is something my family started when I was a kid and we’ve continued it since getting married. We still exchange with my sisters and mom, and whoever is in town for the holiday. It’s evolved into a white elephant gift for some, but I still try to pick gifts I think they’d like and use. My husband usually winds up with several back warmers or energy drinks. When we get home we hide in different parts of the house to wrap the gifts. 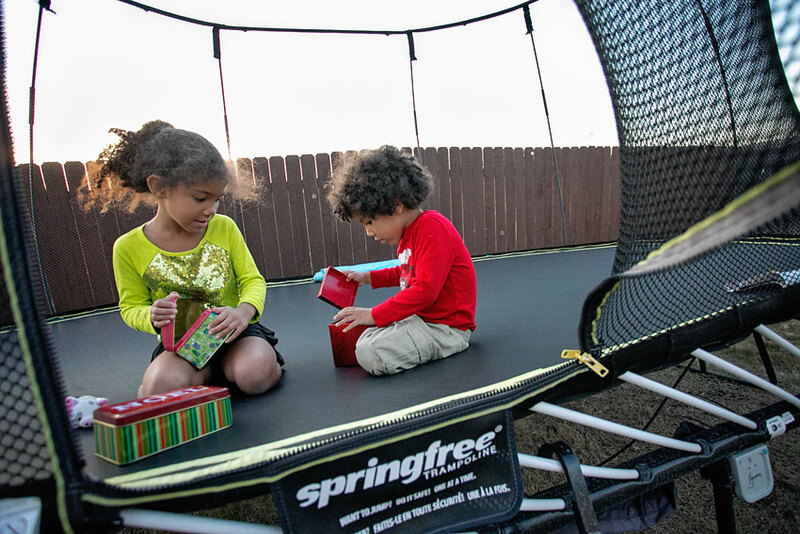 I took the kids outside on the trampoline to get a head start on some of their wrapping. If it’s as warm as it was today on Christmas we may have to open some gifts outside. 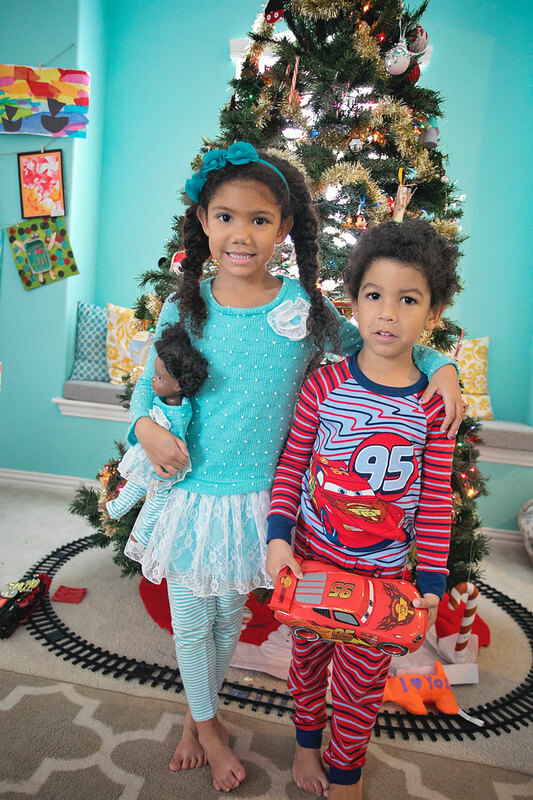 And finally, a tradition my husband’s family had that we’ve continued with our kiddos is opening one gift on Christmas Eve–The gift being new pajamas. We adapted the “matching” pajamas part to being just cute PJs that fit each of our personalities. When they were younger they were footies, but now it’s anything from a princess gown to a basketball uniform. I’m kinda digging the onesies still… For them, not me. There’s still a lot to do, and a lot of good to spread but I’m so excited for Christmas. I’m not ready, but I’m excited. 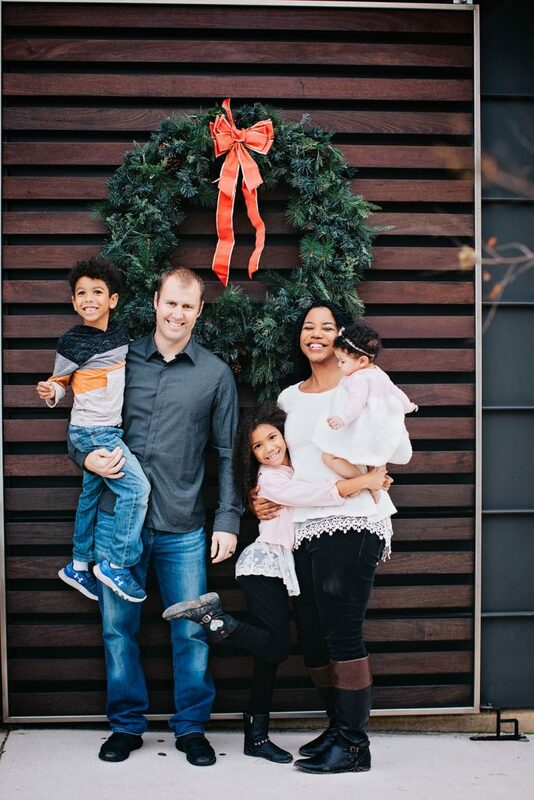 It’s a magical time of year and I’m so lucky to spend it with these quirky family of mine. 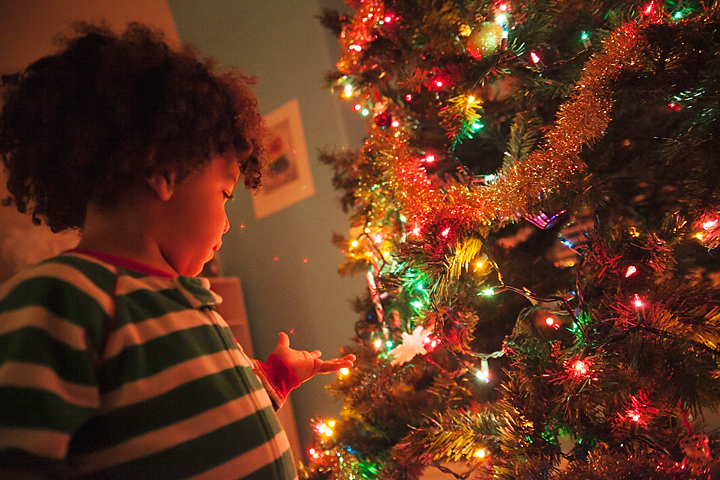 Do you have any family holiday traditions? I’d love to hear them! 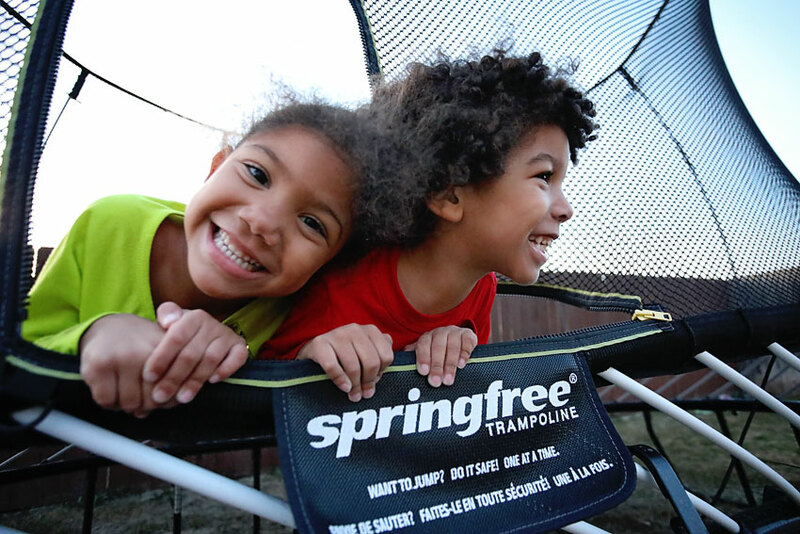 *Earlier this year we partnered with Springfree Trampoline to share some of our fun family traditions. From summer fun to holiday traditions. 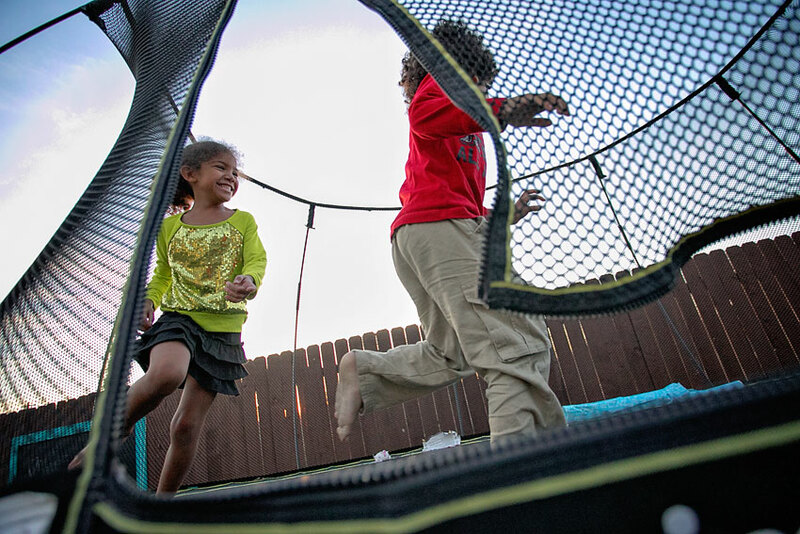 We’ve had a blast on ours and I’ve loved the fact that it’s the world’s safest trampoline. There’s still time to order one in time for Christmas! I’ve been asking that question for years when I see people post pictures on Facebook of a creepy-looking elf getting into some mischief before their kids wake up. I know some kids dig it. I knew my daughter probably would. But I didn’t know why people would go through so much effort night after night. It just seems like an A+ kind of mom thing to me and I’m over here hovering around C- status. So I resisted. I’m so not “that mom.” I’m into magic and fun and Christmas spirit, but not more work. It’s already a busy time of year with parties and cards and gifts and fourth quarter. I aint got time for that. The last two years my daughter has asked if we’d have an elf visit our house because there’s one at Granny’s house. My 11-year-old sister has an elf named Snow. And she told my daughter all about her and how she goes away at night to talk to Santa then comes back to another spot the next morning. I’m not sure what about this made it so exciting but she would not stop talking about that dang elf. After Christmas last year my mom went behind my back and bought an elf for my kids. She “surprised” us with her one afternoon and I quickly whisked it away and said maybe she’d come out next Christmas, knowing full well that thing was not coming back out. Fast forward a year, to this week. My mom gave my kids a DVD with the story behind the elf. She said after watching it maybe she’d help her get an elf. I pulled my mom aside and reminded her she already gave us one last year and that I was hiding it intentionally. Look, are you going to come to my house and move this thing every night? Of course not! So back off! I did allow the DVD to happen. It’s a movie version of the story I think. I didn’t really pay attention much but I saw something about the elf getting sick cause a boy touched him and he lost his magic, and something about them bringing Christmas cheer. Well, all afternoon Lil’ J was going on and on about wanting an elf, wishing for an Elf, she wrote Santa a perfectly penned letter asking for an elf. And before bed time said a prayer and made a wish by the Christmas tree for an elf. Guilt was starting to burrow into my soul. “Maybe if you sleep in your room all night, we’ll go to the store and get an elf,” I told her as I tucked her into bed. Now, I’m not into eerie elves but I am into magic, and making that last for my kids. So while my daughter was sleeping I took the dang elf down, still in the box, and set it under the tree. She didn’t wake up and ask to go into my room before I went to bed, so I thought she’d stay in her room through the night. She did wind up coming in around 5am, but that was better than usual, and I wasn’t about to get up and go put the thing away so I let it slide. (Plus technically I didn’t “BUY” it like I said we would). The next morning she popped up and ran to the front door–Right past the Christmas tree, and looked to see if there was an elf on our doorstep. The doorstep? Who leaves an elf on the doorstep? I guess I missed that part of the movie. And she completely missed the elf under the tree. “I guess my wish didn’t come true” she said deflated. “Well, maybe if you stay in your room tonight we’ll go get one,” I sneakily encouraged. Meanwhile, I ran to my husband and told him to take the elf from under the tree and put it on the front doorstep while we were working on homeschool. He obliged and a few hours later before we left for piano I asked Lil’ J to check and see if Daddy’s car was in the driveway. She grabbed the box and giggled and brought it inside, then remembered she forgot to check to the car–It wasn’t in the driveway, but in the garage. All this–This pure child excitement made it worth it. Yes, I’ll probably ruin the elf thing and subsequently Christmas in the process, but if I can just savor the joy she had on this morning, I think I’ll be ok. I already made a whoopsie tonight as I was trying to take the elf out of the box and take this one and only picture to show you–she woke up! Ok then… She told me. A few things… She named her elf Jingle (she didn’t like any of my suggestions). And she wished for her to hide in high places so that her brother doesn’t touch her. I don’t think my daughter knows about any mischievous/ clever ways that elf hide, so Jingle is going to be a very very basic and chill elf. So I need your help. No, I’m not looking on Pinterest for ideas, unless you have a master list of lazy elf ideas and by that I mean no other props other than the elf itself and whatever static household item it’s sitting on/dangling from. I’ll take those. I’m also not sure we’re doing the “Elf is making sure you’re being a good girl” thing. I mean, if she takes it that way fine but I’m not going to hold that over her. I think she’s most excited to hunt for the elf in the morning. She said that a few times… “She’s going to hide and we have to find her.” Which I take to mean she may be in hidden places? Like an Easter egg? Do you dress your elf? My mom’s/sister’s has a skirt, but she said that it was crazy expensive so maybe–Possibly, we’ll sew a skirt for Jingle and leave it next to her for her to wear? Oh my gosh, LISTEN TO ME! At the end of the year does it go back in a box or just “say goodbye” until next year? If the box goes away I need to remember to be sneaky about bringing the thing out next year–Lawd, must there be a next year? Also, we are exempt during vacations right? Cause I don’t think I’ll manage keeping it up on the road. Ok, I think that’s all of my questions. Yes, I’m a hypocrite, I’ve given in to the elf. We are those people. I am that mom. But it’s all for her. 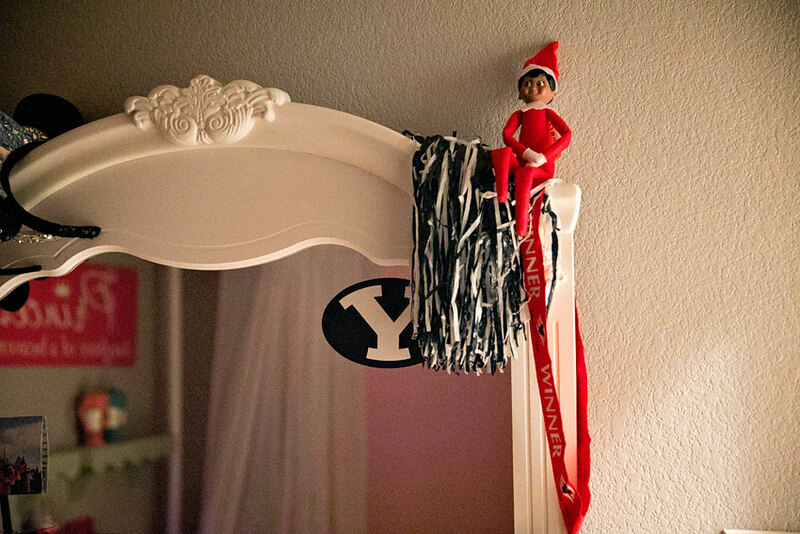 Do you have an elf in your house? How serious are you in your elf antics? Every year I seem to go a little above and beyond when it comes to Christmas gifts for my kids. This year I’ve been debating quantity versus quality and what they want versus what they need. I think I’ve come up with a good way to get a well-rounded selection of gifts that is more than just extra stuff. 1. Something she/he asked Santa for: Growing up Santa brought all of our gifts. 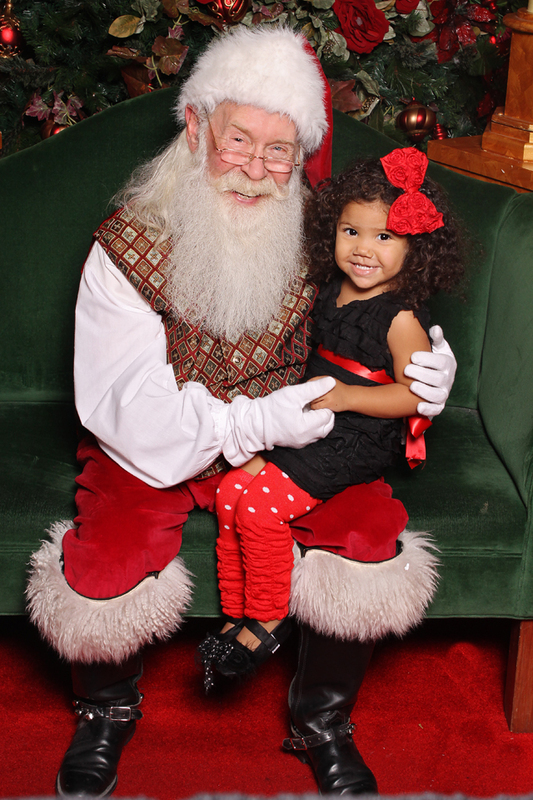 As Lil’ J prepares to climb on Santa’s lap and tell him what she wants, she narrows it down. 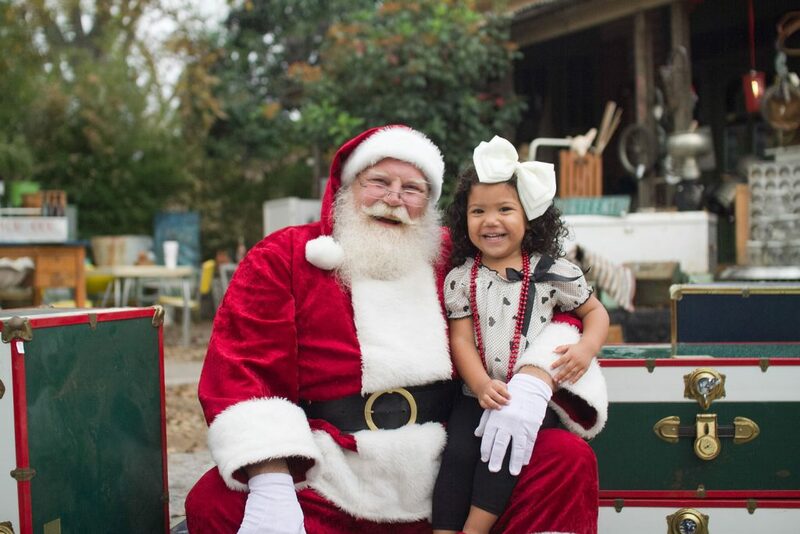 She has been good about asking Santa for just one thing, so going along with that I think we’ll make sure Santa gets what she told him she wanted (yes we met Santa early this year). 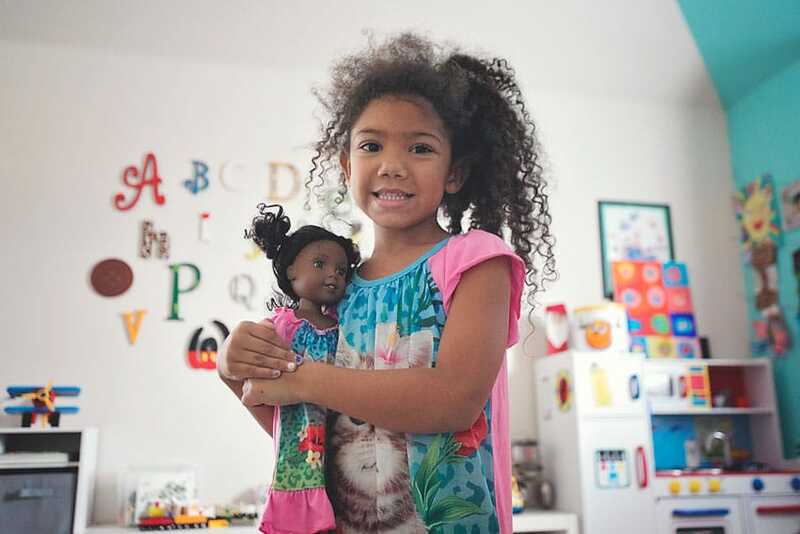 She asked for matching American Girl Doll clothes to go with her new doll. My son asked Santa for a Lightning McQueen toy and we’ve already got that covered. 2. Something we can enjoy together: Like a board game, or playing cards. I recently taught Lil’ J how to play go fish and she’s all about it. When we’re waiting at a restaurant or need a simple game to play she grabs the cards. Maybe we’ll get her Uno or Old Maid and add some more games to the list. Same for little brother. Maybe Hungry Hippo or something they would enjoy playing together. I have a game on my wish list too. I told my husband I’d love Disney Scene It. 3. Something active: My kids love to work out with their dad in our garage gym. He’s forever adding equipment to their lineup. From box jumps to weights. I’ll have to consult with him on this but I think the kids may enjoy some jump ropes, maybe a basketball hoop, or a pogo stick. 4. Something to experience: A trip to a train museum for my son, or private gymnastics lessons for my daughter. I’d love to give a gift that keeps on giving with a joyful experience or talent they develop. 5. 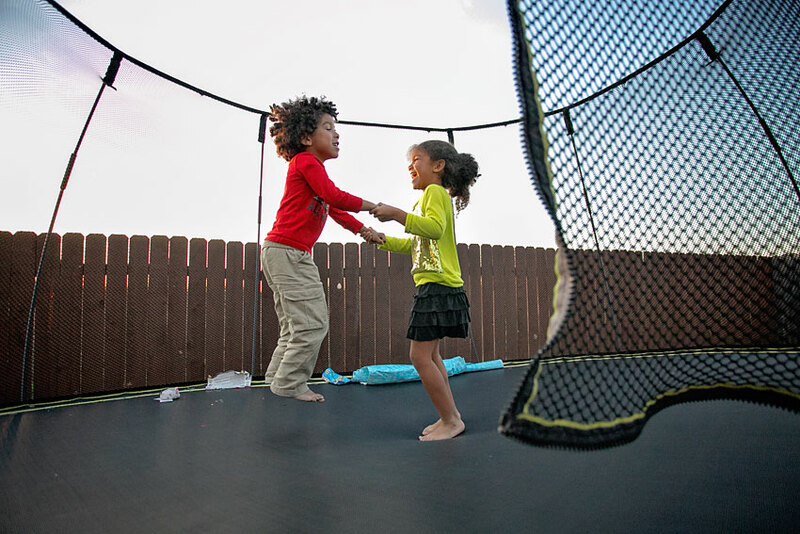 Something special: Lastly I love surprising my kids with something I think they’d love. Whether it’s big or small, it’s just something I think they’d enjoy. Big T has a lot of hot wheel cars and I think he’d enjoy a Hot Wheels track, but I’m debating if I have the patience to keep them organized. A simple set shouldn’t be too bad right? I’m still working on Lil’ J. I’m thinking of getting her a pair of earrings and then surprising her with a trip to get her ears pierced since she’s been asking quite a bit lately. I’ve barely started my shopping, in fact I’m still finalizing our lists of who we need to shop for, but getting this shopping list going makes me feel like I’m making progress. This weekend there’s a Sears sale event to get early access to Black Friday deals so you can save big and enjoy their holidays with peace-of- mind knowing your holiday shopping is already done. Check out Sears.com/gifts for more information. 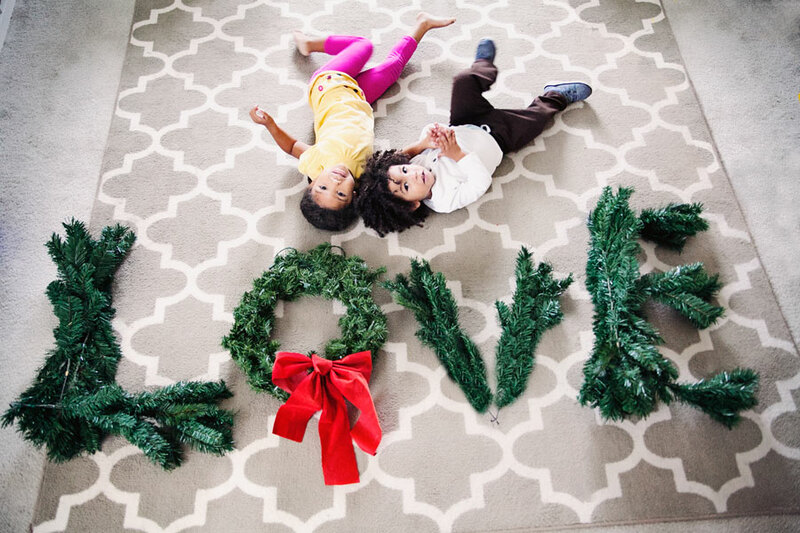 What kinds of kids are you shopping for this year? Leave a comment letting me know and you’ll be entered to win a $100 gift card to Sears to get a kick start on your holiday shopping. The Sears Member Private Night sale event is on Sunday, Nov. 20 from 6 p.m. to 10 p.m. If you can’t make it to the store you can still shop the Member Private Night sale online 6 p.m. to 10 p.m., or shop at Sears on Thanksgiving Day, with deals available both in-store and online starting at 6 p.m. local time on Thanksgiving evening to midnight, or on Black Friday with stores opening at 5 a.m.
Making shopping easier is a big bonus to me, which is why I’ve partnered with Sears on this post. All opinions are my own.